Organizational psychologist Dr. Tasha Eurich wants you to get serious about self-awareness. No, she doesn't want you to journal or meditate or take a deep dive into your own psyche; she wants you to explore the recurring patterns in your life and the values that you hold dear. It's a behavior-based approach to self-improvement, and it might just save your career (or help you find a new one). On this episode of Relate, Tasha Eurich explains why you're probably not as self-aware as you think you are and provides tips on how to see yourself more clearly. On Relate: "When the mid-life career crisis hits"
TAMARA STANNERS:	There's a classic scene in the British version of the TV show “The Office” where manager David Brent, who is played so brilliantly by Ricky Gervais, is at an office costume party with his colleagues. Now there is a couple dressed in 70s disco attire and they do this really impressive super choreographed and really well done dance routine. It feels like you're watching Saturday Night Fever with John Travolta. I mean, it's good. David Brents ego is pretty bruised by this impressive dance display. So even though he's not in costume and he has zero music ready, he decides to clear the dance floor to improvise a routine that he claims fuses "Flashdance" with MC Hammer. He gets everyone clapping out of beat along to get him going. It turns out to be this horrible mishmash of lame moves and his dance is really quite terrible. It's so awkward for everyone in the room, except for David Brent, who just keeps dancing long after his co-workers have given up on the clapping. He simply doesn't see that he looks pretty foolish. It proves, like so many scenes In both the British and American versions of “The Office”, how a lack of self-awareness can really have embarrassing or even career-ending consequences. Now it may be a stretch, but have you ever been in a situation like that? Would you even know if you had? Well, we've got some help, Dr. Tasha Eurich is here to talk self-awareness and how to get better at it. That's what's happening on “Relate”. 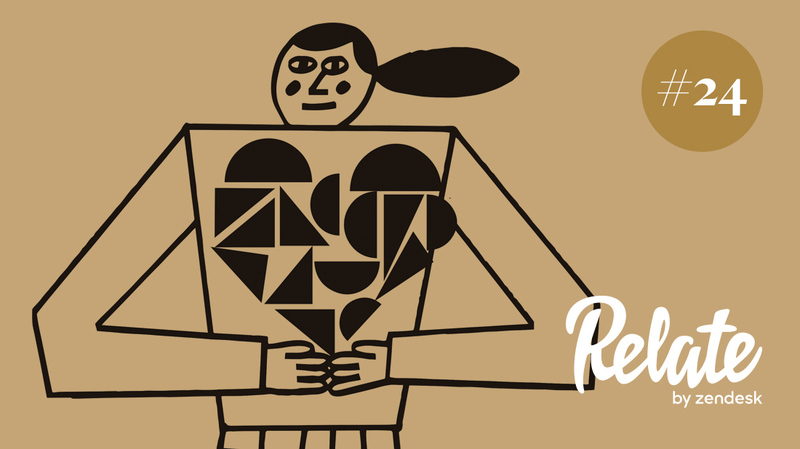 I'm Tamara Stanners and this is “Relate” by Zendesk. And the relationship we're examining today is the one that you have with everyone else in your life. ANDY SHEPPARD:	Yeah, this is a big one. TAMARA STANNERS:	No kidding. That's Andy Sheppard, our producer, and we're talking about how we see ourselves. ANDY SHEPPARD:	Yeah, but more importantly, how that view compares to how everyone else in your life sees you. TAMARA STANNERS: Okay, that sounds real cool, but how are we going to do this comparison? ANDY SHEPPARD:	Well, let’s start with a little psychology statistic 95% of people believe that they are self-aware. TAMARA STANNERS:	I am, for sure, but what does that actually mean? I mean, they have a good sense of themselves and how other people view them? Is that it? DR. TASHA EURICH:	Our data has shown that 95% of people think that they are already self-aware, but the real number is closer to 10% to 15%. ANDY SHEPPARD:	This is Dr. Tasha Eurich. DR. TASHA EURICH:	I am the author of “Insight: Why We're Not as Self-Aware as We Think, and How Seeing Ourselves Clearly Helps Us Succeed at Work and in Life”. ANDY SHEPPARD:	She's been looking at the role that self-awareness plays in how we behave and how we are perceived by others. Perceptions that can have a big impact on our relationships and careers. DR. TASHA EURICH:	Self-awareness helps us relate to the world more effectively for so many reasons. Number one, it helps us figure out what we want to get out of our experience on this Earth and figure out what experiences and opportunities to take advantage of and, which not to. Number two, to it helps us relate better to the people in our lives that are important to us. It helps us shore up and deepen and build our most important relationships with our friends, our family, our loved ones. Third, it helps us relate better to ourselves. What I mean by that is, basically, just having an objective, curious mindset about who we are. ANDY SHEPPARD:	Tasha Eurich wants us all to get serious about self-awareness. TAMARA STANNERS:	So, if I want to improve my own self-awareness, should I focus on the things that I'm already doing, like, journaling about what's going on in my head? ANDY SHEPPARD:	Well this is where things get a little bit tricky. Tasha has found that deep-dive, internally-focused approach might not be as effective as you think. DR. TASHA EURICH:	There are quite a few people who consider themselves self-awareness aficionados. They love self-reflecting or they love writing in their journal. The challenge we found there is actually so many of the ways that we commonly accept help us get in touch with ourselves are, not only can they be ineffective, but sometimes they can actually be harmful to our self knowledge So a lot of times, people with really great intentions of getting to know themselves better might be focused on the wrong things. Just one example, is this idea that we assume if we just spend time thinking about ourselves, introspecting, self-reflecting, that we will automatically know ourselves better. But what the research on this has shown, is actually that the more we self-reflect, sometimes the less better we know ourselves. So, in other words, there's an inverse relationship. TAMARA STANNERS:	That is so counter-intuitive to everything that I've actually led myself to believe, about myself and everybody else so, what does this mean? ANDY SHEPPARD:	A big factor, apparently, is to not confuse self-absorption with self-awareness. DR. TASHA EURICH:	You think about the rise of social media or reality TV or the failed self-esteem movement, which is probably a whole nother podcast, and the sum total of those societal phenomenon are basically tempting us to be self-absorbed, instead of self aware. They're tempting us to see ourselves with rose-colored glasses or to count the number of likes we get on our particular post: I call all of those things, in some total, “The Cult of Self”. We may not be able to change the blind spots or the way we're wired, but we really can make a lot of headway in at least being aware of how much time we're spending exalting ourselves in ways that aren't healthy or objective. TAMARA STANNERS:	So, if the self reflective stuff we're doing, like journaling, can reinforce the unhelpful and maybe inaccurate perceptions of ourselves, what can we do to figure ourselves out? ANDY SHEPPARD:	Tasha suggests that we take a step back and just take a longer view of ourselves, our work and our relationships. DR. TASHA EURICH:	What I tell people is instead of going deeply into yourself, it's better to look at patterns over time. For example, if you're unhappy in your job, instead of delving down into that and really getting in this spiral of self-loathing, just say, “When, in my life, have I been unsatisfied with my job in other situations and what are the commonalities there?” It's a pattern seeking that tends to be more effective than getting sucked into one thing or one question. ANDY SHEPPARD:	In Tasha's work, she's looked closely at people who’ve really figured this self-awareness thing out. She's found some really key traits that they all have in common. So, if we want to work on our self-awareness, looking to these people as guides can be helpful. DR. TASHA EURICH:	The first thing self-aware people understand is their values, they have an appreciation of the principles that they want to live their lives by. They also understand their passions, what are those things that just make them jump out of bed in the morning with excitement. They understand their aspirations, which means, knowing what they want to accomplish in their life and experience in their life. They understand where they fit, essentially, what type of environment is going to make them feel happy and fulfilled. They also understand their patterns, that's basically their personality, what are their consistent ways of behaving over time. And finally, they have a clear understanding of the impact that they have on the people around them. ANDY SHEPPARD:	Are you sure? TAMARA STANNERS:	I feel like I know people who are pretty close to that, but they are few and far between. ANDY SHEPPARD:	It's rare, but I think it's something to aspire to. ANDY SHEPPARD:	Tasha says focusing on some elements of this, a little bit at a time over time, that’s really lead to breakthroughs. The key to unpacking some of this, she says, is figuring out what questions to ask ourselves. DR. TASHA EURICH:	To get at each of those things, we could ask ourselves lots of different questions, but one of the most commonly asked questions to get there, involves the word “why”. DR. TASHA EURICH:	"Why do I believe what I believe?" "Why is that my principal?" "Why did I have a fight with my spouse this morning?" TAMARA STANNERS:	Do some of the answers lie and asking different questions than “why”? ANDY SHEPPARD:	That's exactly it. DR. TASHA EURICH:	What the research on this, has shown us, pretty clearly, is that not only do why questions depress us and increase our anxiety, which therefore makes it impossible to have clarity, but they send us down this road that's not particularly helpful. What our highly self-aware people asked, instead of why, to get at each of those things is slightly different, it’s the question “What?” Instead of saying, “Why did I get in a fight with my spouse?” I might say, “What were my contributions to that situation?” or “What do I need to do differently, in the future, to avoid that again?” or “What do I need to do to repair the crisis we're having in our relationship at the moment?” The difference there is “why” questions tend to be emotional and backwards-looking and “what” questions are rational, action-oriented and future focused. ANDY SHEPPARD:	This research really taps into the behavior approach to self improvement rather than the deep-dive psychoanalysis type of approach. TAMARA STANNERS:	No, but I'm going to. ANDY SHEPPARD:	Okay. One of the show's main characters is Wendy Rhodes, who works for a hedge fund company: She's the on-site psychologist. Now, not every company has an on-site psychologist. ANDY SHEPPARD:	They have some armchair psychologists, I'm sure. It's a growing field, more and more Industries recognize the real cost to the bottom line if there's this dysfunction in the workplace. TAMARA STANNERS:	A lot of that dysfunction, I can only surmise, is tied to the lack of self-awareness. ANDY SHEPPARD:	Yeah. Tasha tells the story of this one particular executive. DR. TASHA EURICH:	I coached an executive, we can call him Steve. ANDY SHEPPARD:	Steve’s boss brought Tasha into help because, unbeknownst to Steve, he was on really thin ice. DR. TASHA EURICH:	He was about to be fired, he had no idea. ANDY SHEPPARD:	Now, the company valued what he could do in many ways, but he also had a lot of unhealthy, unproductive work habits. DR. TASHA EURICH:	His employees were quitting in droves. There was one person, I remember, I talked to who had actually started taking blood pressure medicine because of the stress that Steve, their boss, was causing them. Steve, in talking to him the first time, instead of saying, “Wow! Things are going really badly.” I remember I got a lecture about what a great leader he was. Our process was a difficult one. Very often, is an executive coach, I'm brought in to tell very senior, very powerful people the truth about how they're showing up or who they are when nobody else wants to. It was a tough process, I had to bring him this information and he fought it, then eventually, he started to absorb it and he started to connect the dots. Over many, many months we worked on some of his biggest issues. He would yell at his direct reports or he would just give them directives, instead of coaching them. Little by little, we chipped away at those and we started to change his behavior over time. What was so amazing was, within eight or ten months, he had staged a complete turnaround; not just of how he was showing up at work, but he was actually seeing some pretty significant positive effects of that work at home, as well, with his wife and I think he had a couple of teenage daughters at the time. That tells me, at the end of the day, that no matter how sad anyone makes us, how unself-aware they start out, if Steve got there and if he made that transformation, made that commitment, did the work, almost anybody can get there. ANDY SHEPPARD:	What are you saying? TAMARA STANNERS:	It's not you, "Emotional Support Andy". Who aren't getting that kind of coaching, is there anything we can do to bring those people around ourselves? ANDY SHEPPARD:	Tasha advises you definitely tread lightly on that front. It's called self aware for a reason, it's very tricky to prompt others to work on this stuff. DR. TASHA EURICH:	I worked for an especially unaware boss before I started my company, seven or eight years ago. What I found was ... I sort of had a couple of disastrous attempts to help him grasp the effect his behavior was having on my team and I. I abandoned that. I learned my lesson. What I started to discover was, even if I could change his behavior, I could help myself better deal with it and better manage my reactions to him and the time that we spent together. There was one trick that just popped into my head one day. I was getting my weekly tongue-lashing, as he was often wont to do with the people who work for him, all of a sudden, my favorite TV show from when I was little popped into my head, and it was the Mary Tyler Moore Show. The main character, Mary, works for this surly, mean, caustic boss named Lou Grant. What was funny about it was with the laugh-track that was behind everything he said it automatically made these comments endearing or at least more bearable. So what I started doing, just as a sort of desperate to try anything, was when my boss said something really nasty I would picture a laugh-track behind what he said. I don't know if it's because it jolted me out of the misery that I was in at that moment, or whether it just helped me see the situation slightly differently, but that has been a saving grace for me. TAMARA STANNERS:	That's pretty clever and a pretty easy thing to do really. ANDY SHEPPARD:	She's all about the tiny changes, tiny but consistent overtime. DR. TASHA EURICH:	One of them is called “The Daily Check-In” and it's designed to help us review what happened that day and extract insight, without getting sucked into that spiral that we were talking about before of self-loathing and over-analyzing. Basically, at the end of the day, ask yourself three questions. It could be on your way driving home from work, on the train, or as your getting ready for bed in the evening. You want to ask: number one, “What went well today?”, number two, “What didn't go well today?”, and number three, “How can I use that insight to be smarter tomorrow?” We found that, pretty much, all of the highly self-aware people that we’ve studied do this in some form or fashion. The great thing about it is it takes, literally, less than three or four minutes of just focused thought and I think that's something that most of us really do have the time to incorporate. TAMARA STANNERS:	Dr. Tasha Eurich is an organizational psychologist, researcher and New York Times bestselling author. Her latest book is called: “Insight: Why We're Not as Self-Aware as We Think and How Seeing Ourselves Clearly Helps Us Succeed at Work and in Life”. If you want to get a sense of how self-aware you are, Tasha has a quiz on her website to learn more. I'm going to do it right now at insight-quiz.com. Special thanks to Tina Pittaway for that interview and for helping to put this episode together. Thanks, Andy. ANDY SHEPPARD: I feel so much more self-aware because of this, thank you. TAMARA STANNERS:	I see you better than I did before. TAMARA STANNERS:	So, there is a clear connection to self-awareness and doing really, really well in your career. There's an article on the “Relate” online magazine called, “When the midlife career crisis hits” and it's all about how improving your self-awareness can lead you to a new and more fulfilling career. I am in. Check it out at relate.zendesk.com. Although, I do love this career. ANDY SHEPPARD: I was going to say. TAMARA STANNERS:	I'm super happy here. I love it, but there's always room for growth Andy. That's it for “Relate” this week. Next week, an amazing story about the search for artificial intelligence in world-class checkers. I’m super good at checkers, but I would be afraid to go up against this machine. It’s the perfect story of man versus machine. In the meantime, subscribe to “Relate”, for free on Apple Podcast or wherever you listen and we'll get that episode to you automatically. For articles on how to connect with your customers in deeper more meaningful ways, visit relate. Zendesk.com and for free trials are customer service software, check out zendesk.com. I'm Tamara Stanners, talk to you next week.